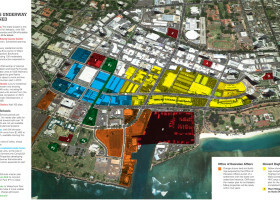 The Hawaii Community Development Authority rejected Wednesday two developers’ plans to develop a key portion of the lands surrounding Kewalo Basin Harbor in the Honolulu neighborhood of Kakaako, but approved The Howard Hughes Corp.’s plans for the two other lots. John Whalen, chairman of the HCDA board, said that the lot that both developers had plans for— the former McWayne Marine Supply site — is a key piece out of all of the three lots in question. Whalen also had concerns that the current board did not issue the original request for proposals for the development of the three sites surrounding the harbor. The Texas-based developer, The Howard Hughes Corp., had plans for all three parcels surrounding the harbor — the former McWayne Marine Supply site, the charter boat building site and the former National Oceanic and Atmospheric Administration lot. Kewalo Waterfront Partners, which includes Japanese-based firms Good Luck International Corp. and Hinamari Hawaii Inc., had plans to renovate four buildings totaling 45,000 square feet at the former McWayne Marine Supply site. Although Kewalo Waterfront Partners only submitted a plan for this site, it did plan to do small renovations at the other two lots. 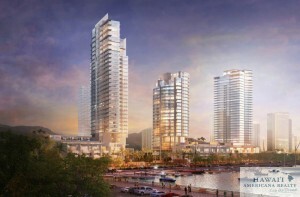 Kewalo Waterfront Partners, in its updated plan, broke the buildings down into five parcels, included a convenience store, and refined the project’s architecture. Building heights also were lowered and more ground level parking was added. The Kewalo Waterfront Partners’ project, over a 30-year span, would’ve brought in more than $100 million in lease revenue. It also would’ve been responsible for $1 million in off-site infrastructure improvements, create 800 jobs and 250 parking stalls. The HCDA voted 6-2 to approve Howard Hughes’ plan for this lot. In the former NOAA lot, the developer plans to pay homage to the “ice house” that was once located at the site and was used to supply ice to harbor-based fishing boats. The Kewalo Ice House would be transformed to include indoor-outdoor courtyards, bringing people together with shared interests in art, food, music and the ocean. The state agency voted 5-3 to approve the developer’s plan for this lot. In total, Howard Hughes lowered its project cost for improvements to the existing buildings and open spaces to $6 million. The Howard Hughes Corp. and Kewalo Waterfront Partners Inc., a partnership between two Japanese firms, are expected to unveil two separate commercial development plans next week for the land surrounding Honolulu’s Kewalo Basin Harbor, an executive with the Hawaii Community Development Authority confirmed to PBN. The state agency overseeing development in the Kakaako area, as part of its July 9 meeting, is scheduled to hear from the two developers regarding their proposals for the small boat harbor, which are likely to include waterfront retail, restaurants and a live entertainment venue. The three parcels aimed for development include the former McWayne Marine Supply site, the charter boat building site and the former National Oceanic and Atmospheric Administration lot. The HCDA plans to make a decision on which proposal to choose on Aug. 5, Aedward Los Banos, the agency’s chief operating officer, told PBN. However, he noted that the Aug. 5 decision-making hearing may be pushed back to the agency’s September meeting. Kewalo Waterfront Partners, which includes Good Luck International Corp. and Hinamari Hawaii Inc., has plans to renovate four buildings totaling 45,000 square feet at the former McWayne Marine Supply site. Plans for the site include retail stores and small restaurants, as well as a live entertainment venue, a bar, a cafe, office space, a multipurpose hall and a 250-stall parking garage, according to the project’s draft environmental assessment. The Howard Hughes Corp. (NYSE: HHC), which has development rights for a total of 22 high-rise condominiums across the street and took control of the Kewalo Basin Harbor in September, plans to submit a proposal for all three parcels. The Texas-based developer, through its senior director of development, Race Randle, has said that its plans for the harbor could include a restaurant that serves fresh fish caught from the commercial boats based at the harbor. Other ideas presented at community meetings earlier this year included developing an oceanfront community center on the makai, or ocean, end of the harbor, which sits directly across from the developer’s 60-acre Ward Village master-planned community. In the meantime, Japan-based Bellavita Inc. has scrapped its plans to develop a 6,000-square-foot Italian restaurant called Napule in the Kewalo Basin Harbor area, Los Banos told PBN. He pointed out that the HCDA board may end up choosing Howard Hughes’ or Kewalo Waterfront Partners’ plan, or just the Texas-based developer’s proposal for all three sites. The board also may end up choosing none of the proposals. Filed Under: Featured, Hawaii Community Development Authority, HCDA, Howard Hughes Corp, Kewalo Basin Harbor Tagged With: Hawaii Community Development Authority, HCDA, Howard Hughes Corp, Kewalo Basin Harbor, Kewalo Waterfront Partners Inc.
Dreams are merely plans, blueprints, aspirations until that moment when they receive validation. Even the best-made plans can be waylaid by things large and small. But on November 25, 2014 Ward Village got the confirmation that its second-phase plans for its state-of-the-art master-planned neighborhood will become a reality. 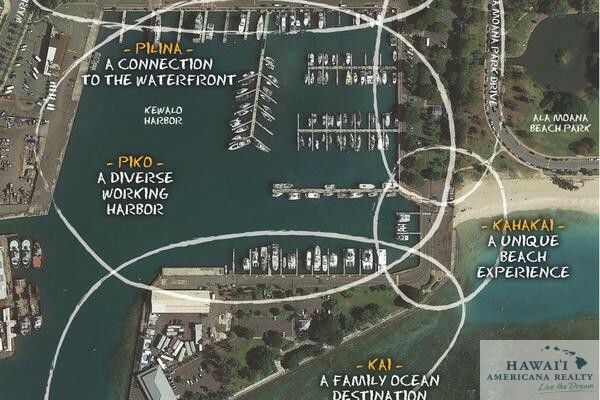 On this day, the Gateway proposal, which will feature 236 residences and 200,000 square feet of retail in two mixed-use towers abutting a one-acre green space stretching to Kewalo Basin Harbor, was approved by the Hawaii Community Development Authority. Designed by Richard Meier & Partners, an architecture firm that excels in everything from single-family homes along the ocean to landmark civic spaces such as the Getty Center in Los Angeles, Gateway is bringing a whole new level of architecture to the South Shore of Oahu in collaboration with executive architect, Architects Hawaii, and a team of local consultants. One tower will jut like a blade into the skyline; its partner, a shimmering cylindrical building, will reflect the location’s transition from the downtown grid to Waikiki. Between the two, a green space will flow with water, walkways, and native plants, acting as a gathering place for the community. Together, Gateway—which will feature a variety of residences, from two-story villas to sprawling penthouses—will be the welcoming point and landmark of Ward Village. Also part of this second phase approved by HCDA is a flagship 50,000 square-foot Whole Foods and additional retail space. Phase two will bring significant economic growth, green space, and amenities to the community that works, plays, and soon lives in Ward Village.When partygoers weren’t spellbound by artists, musicians, and hula dancers, or wrapped up in conversation, they hit the buffet. Guests dined on a sumptuous array of island favorites, including a poke and oyster bar from Oahu’s Poke Stop; cuisine inspired by traditional luau fare from Hale Aina Catering; and delicate tropical desserts from MW Restaurant. The day, from bright and early at 8 a.m. until the sun set and the last of the event-goers headed home, was a true celebration of the story of Anaha, and the traditions that shape our unique island home. 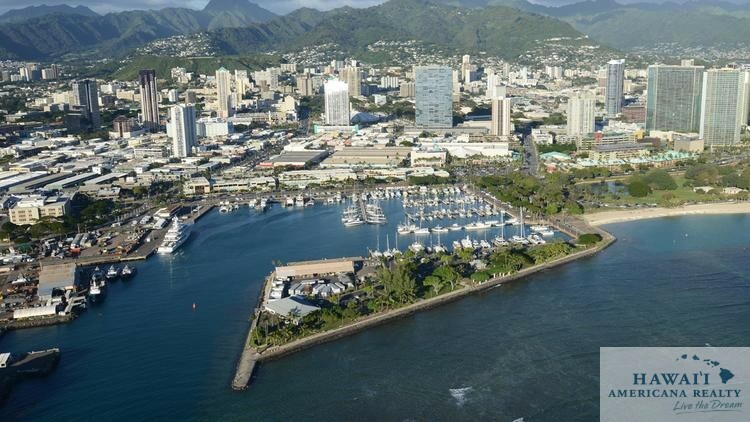 The Howard Hughes Corp.’s redevelopment of Honolulu’s Kewalo Basin Harbor could include a restaurant that serves fresh fish caught from the commercial boats based at the harbor, an executive from the Texas-based developer told PBN. Other ideas presented at a community meeting last week included developing an oceanfront community center on the makai, or ocean, end of the harbor, which sits directly across from the developer’s 60-acre Ward Village master-planned community. 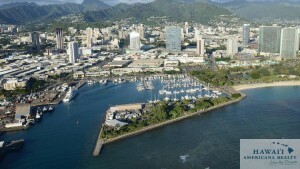 The ideas included creating a diverse, working harbor that supports the businesses that operate within and around it, supporting an urban fishing village in the heart of Honolulu and making the harbor an ocean recreation destination. Race Randle, senior director of development for The Howard Hughes Corp. (NYSE: HHC), told PBN that it has heard from the public and boaters, especially, that it needs a place to get fresh fish. Last Friday, the developer held its second community meeting with Kewalo park users, fishermen, tour operators, neighborhood board members and others to receive input on its conceptual plans for Kewalo Basin Harbor. The meeting, which hosted about 100 people, followed the first one held in November, which also included about 100 individuals. The many ocean-related businesses at the harbor will be included in the redevelopment plans and won’t be chased away, Randle said. For Greg Longnecker, owner of eight boats at the harbor that provide recreational activities such as Xtreme Parasail and Hawaii Pirate Ship, the developer’s involvement in the redevelopment is long overdue. Longnecker noted that Kewalo Basin Harbor should be the gateway to the city and that The Howard Hughes Corp. sees that vision and wants it. Longnecker also said he is not concerned at all about slip rents going up or about megayachts moving into the area. Longnecker said he would like to see at least 10 restaurants at the harbor. Randle declined to specify what type of investment would be going into the land part of the redevelopment, although the developer has been previously noted that a $20 million investment would go into renovating the harbor itself, including the boat slips and other infrastructure. He said that Howard Hughes is close to selecting a design/build team to do the work on this part of the project. The team would proceed with finalizing construction design and getting that part under construction. Permits for this work have been approved. If all goes as planned, it is the developer’s hope to get things going sometime this year. The Howard Hughes Corp., which has development rights for a total of 22 high-rise condominiums across the street, took control of the Kewalo Basin Harbor in September. It secured the lease for the harbor for up to 45 years in a public-private partnership aimed at revitalizing the small commercial boat harbor, which currently has 144 boat slips in various states of disrepair.